Canyonlands Healthcare in Page, Arizona offers one-stop comprehensive primary and preventive care. They offer medical care at their clinic as well as their Urgent Care facility. Canyonlands offers on-site financial counselors who work closely with patients to ensure they have access to all available financial resources. The Lake Powell Medical Center is an appointment-based health clinic; the Urgent Care facility offers walk-in and emergency care. Canyonlands offers special programs designed to improve access to care for those who face financial barriers and need assistance. 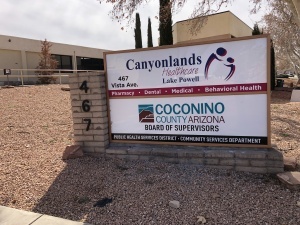 As a private, not for profit, corporation providing consumer-directed health center, Canyonlands Healthcare has been designated as a Federally Qualified Health Center (FQHC) and as such is supported by federal grants under the U.S. Public Health Service Act. Canyonlands Healthcare has the honor of serving Arizona communities for close to 40 years. Since our formative days as a single facility in Page, to the present where we serve 7 communities and over 18, 000 users, our commitment to improving the health of our patients, their families and the community have never faltered. 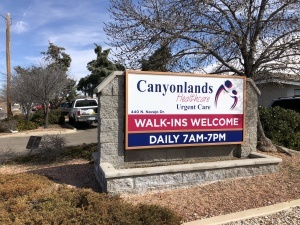 Canyonlands dedicated staff of professionals is here to provide comprehensive medical and dental care to you and your family through a patient-centered, integrated medical home model. Navigating the new Health Insurance Marketplace can be intimidating. But, don’t worry. Trained and Certified Application Counselors (CAC) are ready to walk you through the shopping experience, and help you understand your health coverage options. Call 928.645.9675 to speak with one of their counselors.